Discussion in 'Creation & Theistic Evolution' started by Not_By_Chance, Jan 18, 2019. There are many reasons why I don't believe in evolution, but the other night I was thinking about the size of the world's population and it seemed to me that if evolution were really true, there would have to be many more people in the world than there really are. Even working to an approximate timeline of doubling up on the world population from the time of the global flood, potentially equates to many more people than we have now, although of course, many have be lost to wars, illness and other destructive factors. It really is quite surprising how the numbers mount up and I've uploaded a chart to show you what I mean. Imagine what would be the figures for the evolutionary timescale! I realise that this is only a simplified argument, but it's more than enough to convince me that the account given in Genesis is the true account of the world's history. There are many other reasons why I don't accept the myth of evolution, so I'm not just relying on this one aspect. It is incredible to try to rationalize the human evolutionary mythology. (off-topic, but population growth contradicts Buddhists belief on reincarnation). The Flood happened around 2348 BC, then the Tower of Babel happened around 2247 BC (the earth's dispersion), leaving about two millennia of human history up until the birth of Christ in 4 BC. As you mentioned, wars, illnesses, other destructive factors made mortality rate very low. Now, I am looking at your chart, are you accounting for the the death of each generation, or is this a theoretical idea of how many people descended from Noah since 2348 BC? I simply took an approximation of how long it takes to double the world's population, so not based on Biblical genealogy but current/previous estimates. Having re-checked, I may be out a bit as the current situation is apparently around 64 years for the population to double in size. Nevertheless, as a very crude approximation, it does give an idea of how quickly population can increase, especially during the latter stages and would also suggest to me that the end-times must be getting real close. Human population has fluctuated a great deal, even in historical times. No problem with that, but it would take an incredible stretch of the imagination to extend the shown graph to the left to fit within evolutionary timescales. On that basis, God's explanation in Genesis 1 & 2 seems much more plausible, to me at least. The only Myth in evolution is that God did not plan each event. My mistake - I meant to use the description "fairy tale" rather than "myth." No problem with that, but it would take an incredible stretch of the imagination to extend the shown graph to the left to fit within evolutionary timescales. Not if you know anything of the evidence. Humans, for the vast majority of our time on Earth, were very few; small bands of mostly gatherers, with some opportunistic hunting. Huge numbers were never possible for us until farming was invented. Approximately how many people do you believe were alive at the tower of Babel? I agree completely. Homo Neandertalensis was around for much longer than Homo Sapiens. They occupied a vast area of Asia and Europe and some anthropologists suggest that at any one time their total population was no more than 25 to 50 thousand people. It is quite remarkable that we have found any remains at all. Historians and demographers estimate that the pre-Columbian population of the Americas was 60 to 90 million. They also estimate that by 1700 the population was about 10% of that ---- reduced mostly by accidentally introduced disease. Warfare was also a factor. The Iroquois people (the Five Nations) were once about 500,000 but they were heavily involved in the wars between Britain and France. Following the War of 1812 a census counted less than 20,000 survivors. Well obviously civilization is going to grow exponentially when we have things like modern agriculture. There was no agriculture in early human history. If we go back far enough, we didnt even have language. Imagine how quickly our civilization and population would drop if we lost our ability to speak and farm. The evidence now suggests that the first group of anatomically modern humans to leave Africa had language. I'll try to see if I can locate that cite for you. How am I suppose to answer a question like this? Greetings brother. Good call-out. Questions like this are good for rhetoric, but regardless of how we might answer bears no weight on the historicity that events like the tower of Babel in fact occurred. I didn't happen only if we can come up with a convincing and persuasive answer, it happened because God said it happened. With a number. 1,000? 10,000? 100,000? 1,000,000? Jewishanswers.org gives a figure between 35,000 and 920,000 using different rates of population growth. creationwiki gives a figure of around 65,000. It isn't a difficult question. I'm just looking for your thoughts. My question has no bearing on the historicity of the Tower of Babel. It is a question about population which is, after all, the subject of this thread. 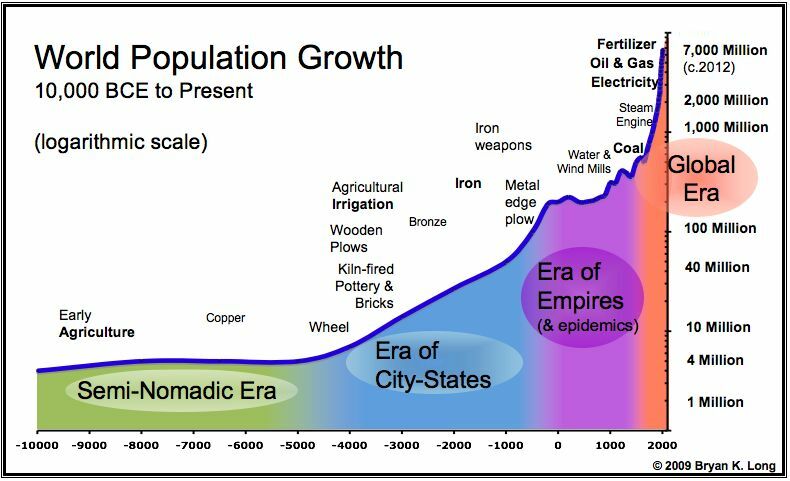 Why would you think human population has been growing throughout its history? If you look around at other species of wild animal, they don't just keep growing -- they fluctuate up and down, but they're limited by the carrying capacity of their range. So were humans. Sorry about taking so long to get the citation. Its sometimes referred to as compound interest, and its been demonstrated many times that the population we have today correlates with the Biblical Flood history. The problem with evolution theory is that the timescale for all this involves 4.5 billion years in which we only need to argue against a billion years of life to prove that the fossil record falls short to account for that many years of life. Evolutionists argue that dinos became extinct 65-million years ago and they claim to find fossils going that far back but do not have a sufficient amount of fossils to account for such a long time. Same goes with human fossils. If evolution were to be true and life has been thriving on this earth for millions and millions of years, then we should be finding fossils piled up to the moon! I don't think evolutionists quite understand how long a million years actually is.